Young children are learning to control their muscles, especially their hand muscles. They need plenty of space to balance food, drink and eating utensils. 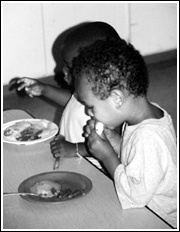 Make sure there is adequate “personal space” for each of the children as they eat. Fine motor control is a major developmental task of young children. Strength, endurance and control are minimally developed for using eating utensils. Help children increase skills by giving them plenty of practice with spoons, forks, knives and serving utensils. Use child-sized eating utensils and equipment. Offer foods to spread, cut, break, spear or spoon from a bowl. This variety allows children to gain skills. Caution: expect children to have varying degrees of ability. Children should have lots of time and opportunity to practice these skills before competence is expected. Adults are role models for using utensils, choosing and eating foods and behaving in acceptable ways at the table. They help shape children’s eating behavior. Adults elaborate and embellish on children’s “food” vocabularies. Adults help children trust the eating environment by making sure they are safe both physically and psychologically. Children can participate in preparing food. They enjoy eating what they prepare. Children gain a sense of autonomy (and self-control) as a part of food preparation. This results in children feeling healthy control in their relationships with food and eating. equality is not fair. Fairness in feeding children should be based on letting the children’s natural body cues tell them when they are full. What is fair is to trust children will eat as much as they need. how to pass bowls without accidents and how to choose portion sizes that match how much they can eat. addition, remember that some foods take longer to eat than others. A ham sandwich takes longer to eat than a half cup of pudding! settings where children serve themselves, be alert to how long children must wait to begin serving themselves. Offer enough bowls of food or pitchers of drink so that children have limited waiting periods. attract children’s attention. Children want routine and familiarity in their foods.